George Graham Reviews Kyle Hollinsworth's "Then There's Now"
Great jam bands thrive on the interactions among the members. But often interesting things can happen when individual members of group who are so used to improvising together, do their own separate musical projects. This week, we have an example of a solo CD by a member of my own personal favorite jam band The String Cheese Incident. It's keyboard man Kyle Hollingsworth, and his new second CD is called Then There's Now. Forty-one-year-old Kyle Hollingsworth is a native of Maryland and studied jazz piano at Towson State University. He played in some bands in that area, including one called Black Friday, until he moved to Colorado in 1993, and after playing in a group that opened for the then-emerging String Cheese Incident, he was invited to join String Cheese and has been a member since the mid 1990s. The String Cheese Incident, meanwhile, developed a large and devoted following, to the point that the group launched a travel agency for booking tickets for people to follow the band around on tour, as Dead Heads did back in the day with the Grateful Dead. In 2008 String Cheese decided to take a hiatus. So the different members have been doing various solo projects. As mentioned, Then There's Now is Hollingsworth's second CD. He released a quite diverse and interesting recording in 2005 called Odd Or Even. Then There's Now is a further departure, in that it's not nearly as diverse -- it's focused more on the kind of funky and groove material that made up part of his CD from four year ago, and it's almost entirely a vocal CD, as opposed to the mostly instrumental Odd Or Even. he works with a different band on this CD than the last, apparently a group that he put together and with whom he intends to tour, rather than just a collection of people assembled for the CD. The band includes Ryan Jalbart on guitar, Garret Sayers on bass and Dave Watts on drums. There are also frequent appearances by Liza Oxnard doing backing vocals. The one notable cameo appearance is singer-songwriter Dar Williams, also adding her vocals. Hollingsworth is not the greatest singer, but he is competent and likable. He does continue to make use of his collection of vintage keyboards, including Hammond organ, plus such 1960s mainstays as the Clavinet and Mellotron. It can be interesting hearing those instruments with the funky, sometimes hip-hop-influenced rhythms. And speaking of those hip-hop grooves, another of the guests on the CD is a turntable scratcher who goes by DJ Logic. 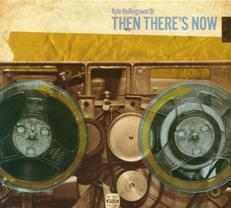 Kyle Hollingsworth's new release Then There's Now is a contrast from his previous solo recording, Odd or Even. The earlier one was mostly instrumental, this one is mostly vocal, which may or may not be an asset. The earlier one was quite long and had some extended jams. This one times in under 40 minutes, not counting the bonus track, and the tunes are a good deal more succinct. There seems to be a conscious avoidance of the jam-band approach. The last CD had a number of guest appearances, including from jazz musicians. This one is primarily with a regular band. But both are appealing recordings from a multi-faceted artist who is an important part of the String Cheese Incident. Of the two, Odd or Even is the more substantial. But Then There's Now, is certainly a worthwhile recording that has its own distinct sound, and will no doubt be of considerable interest to the many String Cheese Incident fans, as they wait for the band to regroup. Our grade for sound quality is about an A-minus. The mix has everything in about the right proportions, but the clarity and dynamic range are mediochre. (c) Copyright 2009 George D. Graham. All rights reseved. This review may not be copied to another Web site without written permission. To Index of Album Reviews | To George Graham's Home Page. | What's New on This Site.